Val Vigoda, the star of the current off-Broadway smash musical Ernest Shackleton Loves Me, has carved out quite a remarkable, uncommon musical career. 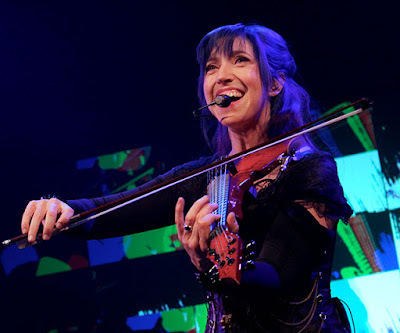 This pioneering singer/songwriter, armed with her 6-string Viper violin, spent close to two decades with her band mates in the theatrical pop/rock trio GrooveLily, creating album after album of smart pop music and theater productions. Along the way, Val also scored arena-touring gigs with Cyndi Lauper and Joe Jackson. When “rock theater” juggernaut Trans-Siberian Orchestra first split into two touring casts, Vigoda secured the role of Concertmaster of the West Coast troupe. After a recent split with her longtime husband and musical partner, along with GrooveLily going on hiatus, Val has come out swinging. 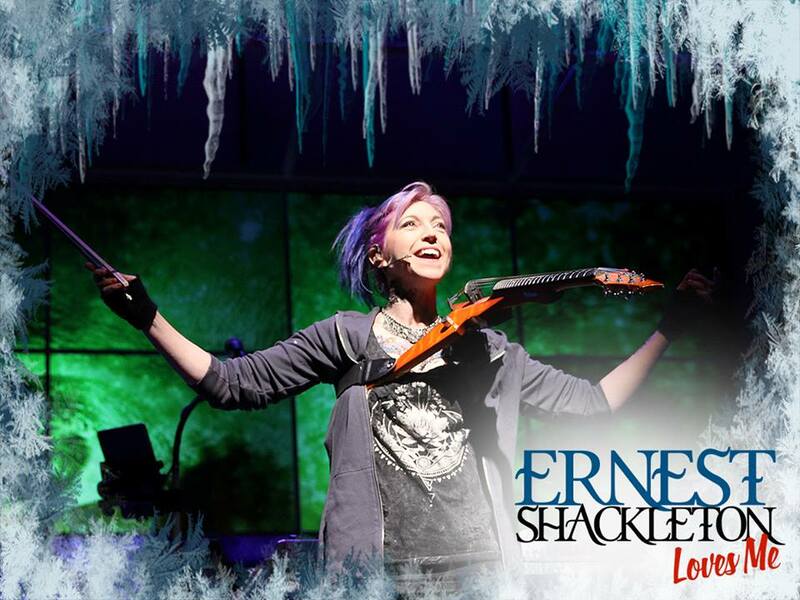 She recently released her empowering new live-looping solo album, joined up with the innovative Electrify Your Strings music education program and has landed in New York with her long-in-development epic musical adventure about Antarctic explorer Ernest Shackleton. While Val points out how inspirational Shackleton was on his voyage, we learn here how inspiring Val herself is. In this in-depth chat, we touch on all of that and more. Dan Roth: How did you come to choose the violin as your instrument of choice? Val Vigoda: I have music in my family going back many generations. My grandfather was a cantor and my Dad was a wonderful jazz pianist. From the time I could walk, I was sitting on the piano bench with my Dad and starting to read music. By the time I got to elementary school, I wanted to play an instrument and I really wanted to learn the trumpet. I had just lost my baby teeth so they wanted me to wait a year for the trumpet, but they needed violinists in the orchestra. Instead of waiting a year, I decided to go with the violin and I fell in love with it. I am so glad that I did not go with my original instinct to play the trumpet because I would never be able to do what I do today. DR: Who has inspired you musically along the way? VV: From the classical side of the instrument - Nathan Milstein, Jascha Heifetz, Itzhak Perlman, Nadja Salerno-Sonnenberg, Joshua Bell, my teachers Ed Johonnott and Danny Heifetz. As far as violinists from outside the classical realm, musicians like Mark Wood, Joe Deninzon, Julie Lyonne Lieberman, Christian Howes, and so many others...all really joyful players using the instrument in such diverse and creative ways. DR: I had read that it took you a decade or so to rid yourself of the "violin face". What did you mean by that? VV: Ah, the "violin face"! We are taught as classical string players in such a fear-based way. (And to be clear, I’m not referring here to my specific teachers, but the overall gestalt of classical learning.) It is all about precision and hitting that right note and God forbid you tap your foot. As students, we are taught to practice putting our fingers in the correct place on this weird instrument that is very unnatural and counter-intuitive -- and then, if you get really good, you get to go play for the “jury.” (!) I remember playing for the jury and I couldn't stop my knees from shaking, being so concerned with how they would grade me. It was really the opposite of what music should be about. I found that I could not smile and concentrate on playing at the same time. I looked like I was stern, almost angry when I played. It was not until I started getting into bands and playing music that wasn't classical that people started to notice and would tell me that I looked like I was not having fun. It was a physical reflex - I was so used to concentrating on playing correctly, with a certain grimness associated with that, that it took me a long time to relax, enjoy and re-engage with the simple joy of playing music. DR: You are also that rare violinist that sings lead as well. Since you do both beautifully, tell me about that journey - did that come naturally? What are the challenges? VV: Well thank you for those kind words. For most of my early life, singing and playing the violin were two very separate activities for me. I have always been a singer; I think it probably came from my grandfather (a renowned cantor with a gorgeous tenor voice). I was always in choirs, and in college I was in an a cappella group. When I was eight years old, I started playing the violin and got serious about it pretty fast. I got involved in chamber groups and orchestras. It wasn't until I was a teenager and started writing songs that I even thought about combining these two skills. When I first tried to do it, it felt like my brain was being split apart in this incredibly uncomfortable way. Just singing one note and playing that same note at the same time was so difficult and very unnatural. One night at The Bitter End, I saw Allison Cornell sing backups and play the violin with Rachael Sage. It was my first time seeing someone multi-task like that and it really inspired me. I spent a couple of years making my brain hurt, trying to sing and play at the same time. After a while, I could sing while playing a simple part on the violin, Over the years, it's just gotten easier and easier to the point where it now feels natural to me and I can do different counter-meters and odd rhythms and different kinds of harmonies with myself. The biggest breakthrough for me on this journey was finding the Viper, which is designed and built by Mark Wood. Playing a violin that has a chin rest means having your neck area squashed a bit. That meant to me that either the singing suffered or the playing suffered. As soon as I discovered that I could have this different design with the harness and the freeing nature of the way that the Viper is designed, it really changed my world. I could sing better, I could play better. DR: It really seems like the perfect instrument for what you do. I have seen it noted that you were the first female Viper player. Do you like that pioneering moniker? VV: Absolutely! I was Mark's first female client and I am honored to hold that distinction. That instrument really has defined what I do going forward. DR: How many strings does your Viper have? And do you enjoy the extended range? VV: It has six strings and Yes! I love having those fifth and sixth strings. For so long, as a member of GrooveLily, it was mostly just the three of us - keyboard, drums, and electric violin. So when performing we had to fill up as much musical space as we could, and having that low C and low F string for power chords and rhythm-guitar-esque sounds while I am singing is just perfect. It really helped fill out our sound and I love being able to roll full arpeggios. DR: When you compose songs, do you write them on a piano or on the violin? VV: Both; it depends on the song. I do more and more on the violin - I have had it for so long and I can think more chordally and harmonically on the instrument than I used to be able to. I used to always write on a keyboard first and then try and translate it to the violin, which was a bit of an unwieldy process. DR: When you write, are you more lyric-minded or music-driven? VV: I am such a verbal person. I almost always will start with the meaning, the content, the lyrics and then the music. For many years, I was collaborating with my "wasband" [Laughs] and we used to say that our skill sets were almost like a graph. I think in terms of melody and words (linear, X-axis) and he is a "chord" person, thinking harmonically (vertical, Y-axis). Together we worked very well that way. For a time, we were incredibly prolific; we were churning out writing assignments as quickly as possible and we found that my verbal facility and his harmonic facility made for a fast, efficient way of composing. I would be being more of a lyricist for a time, while he stuck to the music. It is only lately that I am finding my way back to writing more music again. DR: In May of 1994, you released your first album, Inhabit My Heart, with the single "Raindance". This was before you had formed GrooveLily and before your Viper even? VV: Yes, though we did eventually re-brand it as a GrooveLily album and we as a group would perform some songs from it in concert. DR: From there you formed the trio, GrooveLily, with whom you released ten or so albums. Where did the name come from? VV: When I was thinking of band names, I knew I wanted one word and I wanted that word to represent what we were about, which was the combination of rhythm and beauty. This image of a dancing flower came into my head which is a GrooveLily! I had a friend who is an artist and I asked him to draw that and he came up with our logo. It was this flower with a blossoming top and then petals and stem akimbo, which I loved. If anyone is looking to name their band, don't name it something that is hard to say or hard to pronounce or hard to spell. [Laughs] That was a big issue. DR: Most artists aren't crazy about having their music labeled or put into a defining category, but it does become necessary to help sell and promote the band. GrooveLily, at least in the first few albums, was difficult to categorize. You were playing both the college circuit and folk festivals with this unique instrument lineup playing a jazzy, pop, smart blend of pop music with an occasional theatrical feel as well. How did you see the band? What was GrooveLily about? DR: The band was unique in being a violin/keyboard/drums trio. Did you ever think about expanding the sound with other instruments? VV: We did. For a while, we became a 5-piece band with guitar and bass. It was great but it was also expensive, quixotic and great fun. [Laughs] The violin can be a rock instrument but there is something about a guitar that cannot be replaced. I loved adding the sound of a guitar and bass to fill it out but I also really liked us as a trio. DR: There definitely was a noticeable shift in what GrooveLily was doing in their first five or six releases and the release of Striking 12: The New GrooveLily Musical in 2004. VV: We tried being a square peg in a round hole for years when we were trying to make it in the "music industry". We kept trying to do things that were radio-friendly and come up with that elusive hit song. We tried to smooth out our rough edges. We were quirky as hell. We had three lead singers from three different backgrounds. I came from a classical background and listening to singer-songwriters, Brendan came from the world of ‘80s pop and musical theater, and Gene was a jazz drummer. There was no other band for us to follow or say, "We want to be just like them" [Laughs] It wasn't until we did what seemed like a thousand unsuccessful showcases for record labels that we took what they said to heart. We would always hear, "You are a little too theatrical. You sound like Broadway." so we finally decide to treat that as a feature instead of a bug. To make that turn into the world of theater was what made our career take off. When we wrote Striking 12, we knew we had found our niche. The timing was such that the trend to have musician-actors hadn't happened yet. We were really pioneers in that way. The John Doyle production of Sweeney Todd hadn't happened yet, for instance. When we showcased our Striking 12 show in 2004 at the National Alliance for Musical Theatre, it was a bit of a shock for everyone. We came out on stage to our violin and keyboard and drum set in front of this audience filled with all of these New York and regional theater movers and shakers and they were waiting for the actors to come out. We proceeded to do the whole thing ourselves. We were literally swamped with offers and that changed our lives. We were not only gaining notoriety in the theater world but also as writers for others. DR: The band continued in that musical theater world, creating A Little Midsummer Night's Music, Sleeping Beauty Wakes, and Wheelhouse. Looking back, do you have a favorite album that really still resonates with you? VV: Tough question. I feel like Striking 12 is when we let go of all of the anxiety and said, "This is who we are." For that reason, I love that record. I love looking back at the early stuff and finding the seeds of what we were able to do later. As far as quality of songs and recording, I would have to pick the Sleeping Beauty Wakes album. DR: Is GrooveLily on hiatus? What is its status? VV: We are definitely on a hiatus right now and I do not know if there will ever be a reunion. Brendan has said he is not interested in performing anymore.Gene and I have been talking about doing something together. Here is my dream: Striking 12. 2018. The 12th anniversary of being on Off-Broadway. Me, Gene, Ben Folds. DR: Does Ben Folds know about this dream? VV: No. [Laughs] That's why I'm putting it out there. DR: In the late '90s, in addition to GrooveLily, you were touring arenas with Cyndi Lauper and Joe Jackson. Cyndi is so great about having female musicians in her band and really championing them. I got that gig after someone that worked for her saw me at a GrooveLily showcase and they called me because they were looking for a violinist/vocalist. It was my first time playing arenas; we opened for Tina Turner on one tour and then a couple years later we were opening for Cher. I toured with Joe Jackson in 1998 and 1999, in between the two Cyndi Lauper tours. He was touring his Heaven and Hell album that Sony Classical released. That same violinist that I mentioned earlier that I had seen at the Bitter End playing with Rachael Sage all those years ago was now Joe's violinist but she couldn't do this tour. Joe flew to New Orleans to see the Cyndi Lauper concert and auditioned me afterwards. It was a real departure from what he had done before. For the tour it was him, Elise Morris on keys and me on violin and vocals. So in addition to all of great rock and roll songs that he is known for, we were also doing this classical song cycle. DR: On each of those tours with Lauper and Jackson, many of their classic songs were presented in a different way. Did you have some input in to how you would be playing them at all? VV: Somewhat, yes. Both of them were interested in re-imagining the songs that they had played thousands of times. DR: Let's chat a bit about your time with Trans-Siberian Orchestra. After an initial tour in 1999, they split into two touring groups in 2000. 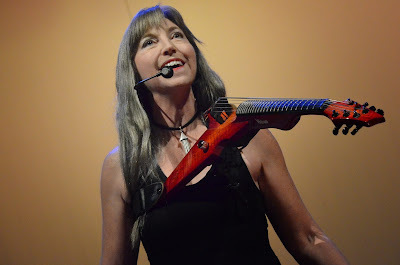 Mark Wood was the original and founding String Master and went to the East touring group after they split into two. You took on that role with the West touring group for the 2000 and 2001 tours. Tell me how you became part of this. VV: Mark Wood told them that he had just the right person for the West Coast cast and here she is. There was no audition. I was hired, given the music to learn and told where to show up for rehearsals. Boom. DR: Were you familiar with TSO before this? VV: I had actually played in the "local strings" section when they played the Beacon Theater in 1999. DR: Did you work with Mark at all during the rehearsals? DR: With TSO having been around for so long now, I think most string players that are interested in playing at their Shows have a good idea what they are getting into. DR: 2000 was the first "West Coast" TSO tour so they were hitting areas outside of the East for the very first time. Were you getting a lot of classically-trained musicians? VV: All classically trained. And they varied widely in their ability to pick up music quickly. My favorite group of all were technically possibly the least-skilled players that we had hired for the tours but they were so wonderful - I don't want to say anything bad about them. I am talking about the El Paso string players who were almost all family and they were so happy to be there. They had the best attitude and were joyful; they did not have "violin face"[Laughs] They were so excited to be part of the Show and they were an absolute pleasure to work with. They did not hit their high D's, I didn't even care because they were so joyful. Then you go to big cities like Chicago or Minneapolis-St. Paul where you are drawing on musicians from major orchestras and some of those players who were technically amazing were such a drag. I spent a lot of time in the rehearsals getting the players used to working in this new environment. I worked with them on getting them not to put their violin on their knees. Classical violinists aren't used to working with amps and mics and feedback. Often they would play and then at a rest, place their violin right in front of the speaker causing terrible feedback. Also, the mic attached to the instrument would pick up their breathing, which we would have to work on. I am so glad that I had the opportunity to have that gig. It was great for practicing, flexibility and leadership skills. It was also a great help in developing my stage presence; jumping on things, waving my bow around and feeding off of all that rock energy. The whole job as their concertmaster is never-ending, just constant motion. DR: Did you get much direction during your time on how they wanted you to look or perform? VV: Oh no. I just played, ran around the stage, jumped on things, waved my bow around and riled people up. [Laughs] It was a great time, especially on songs like "Mozart". I basically followed Mark's lead on what he was doing with the East group. DR: I’ve interviewed other performers from those early TSO casts and many of them – particularly on the West – have mentioned that those early tours had more of an emphasis on their performance and personality and chemistry with the audience rather than the effects and spectacle that is there today. I have heard fun stories of rubber chickens, silly string and much more on stage. Can you speak to that? VV: Oh yeah. It was so much fun touring with those guys. I remember vocalist Kay Story was singing that heartfelt Stevie Nicks song "Landslide" and they would torment her trying to get her to break character, One night, I think it was a little toy mouse on a string that was creeping along the stage and Kay kneels down and starts petting it, completely unfazed; it was awesome. [Laughs] There were so many pranks being played. They were such a wonderful group of people but I was somewhat apart from them because I was always running off to do rehearsals with the strings. I had such a great time. I had never before really had the experience of almost commanding the audience to applaud, gesturing in that almost-pompous way to the audience while performing. [Laughs] It was a lot of fun. Mark was great at that because he naturally does it without being pompous. DR: The cast was really a melting pot – metal rockers, Broadway performers, journeyman rockers. Anyone you really connected with? VV: Oh sure. Malcolm Gold who was the bassist on the 2001 tour later toured with GrooveLily when we went to a 5-piece. John Margolis wound up being my neighbor in NYC and we did a gig together. So many great people - I loved Sophia Ramos - she is just an amazing, fierce vocalist. And of course Michael Lanning, Paul Morris, Kay Story, Damon LaScot, Rebecca Simon, and I loved touring with Al Pitrelli and Jane Mangini. Everyone on the bus was just so much fun. DR: So after the 2001 tour, you were gone from the TSO stage. VV: Yes, though they did ask me back to tour the next year. I will always be grateful to TSO though - because it was around this time, as I mentioned earlier, that we, as GrooveLily, decided as a band to move into more of a theatrical mode and TSO was the inspiration for us to write our own holiday concert with a story, Striking 12! DR: Over the last few years, there has been a bit of a "Val Vigoda Renaissance" – The Ernest Shackleton Loves Me musical, your new solo album Just Getting Good, and your recent work with Mark Wood's Electrify Your Strings! music program. What prompted this flurry of activity? VV: It's so interesting. Both Ernest Shackleton Loves Me and Just Getting Good were precipitated by the fact that I love performing so much and I get such energy and exhilaration from it. Brendan, who was my collaborator for so long, couldn't care less if he ever steps on to a stage again. He much prefers now to be behind the scenes, writing and arranging. Musicals can take a long time to ripen; we have been working on Shackleton since 2009. This all came about with us trying to write something together where I would perform and he wouldn't have to. We had just seen this incredible museum exhibit about British Antarctic explorer Ernest Shackleton that really inspired us. Shackleton has to be one of the most inspiring, optimistic heroes ever. That exhibit just blew me away and really stuck with me. We then got the opportunity to write something for me with the amazing playwright Joe DiPietro. Joe asked, "What do you want to write about?" . I told him that we had seen several one-person shows that were autobiographical and I really didn't want to do that. I remember telling him, "I want to do something big, something epic and adventurous, I don’t know, like, Ernest Shackleton!" [Laughs] We told Joe the saga of Shackleton's trip to Antarctica as well as the story of how he insisted that this 14-pound banjo be carried along their trek and be used to keep up the spirits of his men. Joe came back to us with an outline of a one-person show called Ernest Shackleton Loves Me. DR: Was it similar to where you are at with it today? VV: In a way. We brought a director in and we did a read-through. The director liked it but said, "You are singing about Ernest Shackleton. You're telling us the story of Shackleton. Where is he?" We realized that this really needed to be a two-person show and that's when things really took off. One of the big aspects of the show was that my character is a modern composer that plays electric violin, very much like me [Laughs], and this character was using live looping. Again, musicals take a really long time. We started this in 2009 and here we are in 2017 finally hitting New York. While we were waiting for this to get produced, we decided to use this looping technology that we were learning to create something that we could be in charge of, so Just Getting Good was something that we created together as well. The themes of both projects are all about spreading your wings as a self-reliant, empowered, courageous human being. Ernest Shackleton Loves Me is really a feminist manifesto of hope, optimism and not relying on others. So these themes were all there as we created them together, but now that both are seeing the light of day and Brendan and I are no longer together, it sort of all makes sense in hindsight. DR: I find it interesting that you had this theme, particularly on Just Getting Good. It is such an empowering album lyrically. The title track speaks of “just getting good” and standing your ground. “If You Believe” talks about doing what you love and believing in who you are. “Level Up” talks about overcoming feeling alone and afraid. “Larger Than Life” talks about helping yourself and leaving the past behind. VV: All of the songs on this album are in alignment with that theme. DR: Was it challenging to start working without a band? VV: Hugely challenging. It was the same "My brain is coming apart" feeling that I had long ago when I first tried to sing and play the violin at the same time. [Laughs] For such a long time, I was one who did not embrace technology, but for performing with live looping I dived in. It was a steep learning curve but eventually it got easier and I became more comfortable with it all. I keep a picture hanging up for inspiration; it is a woman embracing a man who is entirely made up of images from the Ableton Live music production software. It reminds me of falling in love with technology and that's what I have been doing for the past few years. It's really all about planning and multi-tasking and is another approach to creating music. DR: Do you rely on a lot of foot pedals when performing this way? VV: Yes, mostly as navigational pedals. The patch changes are in the computer so it does involve some pre-planning. DR: This album contains some of your songs from your career but here in fresh new arrangements. For instance, I noticed that you re-did "If You Believe" which is a song that you wrote for one of the Tinkerbell movies and "Thaw" which was on an older GrooveLily album. How did you pick which to tackle? VV: I looked at many of the songs that had become favorites in their new arrangements over the past five years. I had done a version of Peter Gabriel's "In Your Eyes" early on and that didn't quite make the cut because the arrangement was not that interesting. I did go with "Thaw" which you mentioned but it was a new arrangement that I put together in memory of my mom. I mashed it up with "Irish Lullaby" which she used to sing to me. Thaw is such a meaningful song to me and I feel like adding in the "Irish Lullaby" portion has made it even better. But we chose songs that thematically were in alignment. We wrote "Just Getting Good" and that was the name of this concept so they had to fit. This was recorded in concert and the concert was actually longer but we discarded a couple songs before we arrived at the eleven on the album. DR: Another interesting song choice is a song that dates back to the 1850’s: “Hard Times Come No More”. VV: That is just a beautiful song that was on our radar for a while. Eastmountainsouth does a great version of it as does James Taylor. My version has Brendan's arrangement and has some beautiful reharmonizations in it that I love. DR: Let's talk a bit more about your musical, Ernest Shackleton Loves Me which you are now starring in at the Tony Kiser Theatre here in New York. You mentioned earlier that it has been in the works since 2009? VV: It was first commissioned by TheatreWorks in Palo Alto and La Jolla Playhouse came on board as well. It has gone through readings, several workshops, three developmental productions and here we are finally in New York! DR: Do you enjoy acting along with playing, singing and composing? VV: I love it!! I used to have a fear of it because I am not necessarily a trained actor. But really acting is really just an extension of communicating with your audience, and it’s all about presence. I have been taking some Meisner classes in Seattle which have been super fun. DR: Has the show's story changed at all for this New York run? VV: There have been some tweaks along the way, and yes, for those that have seen any of the prior productions, there are some changes that you will pick up on. I’d say it’s 30% different from our last production. We’ve been doing a lot of work over the past month!! DR: I don't want to spoil it for anyone that has not yet seen it, but does Shackleton still make his entrance to the stage in the same fashion as the 2015 New Jersey production? VV: He does! [Laughs] I think it is one of the great musical theater entrances! DR: You are playing a Viper on stage. There is a second Viper on stage during the show. Is that a backup? DR: Similarly to your past work, Ernest Shackleton Loves Me is uniquely tailored to you and your talents. Striking 12 certainly has continued on with various casts performing it. Can you see Shackleton without you? VV: We totally want to license the show and we will. There are definitely ways to do that which we are going to explore. We have already seen that the show can go on without me as we had the wonderful Angel Desai step into the role for some shows during the New Jersey run. 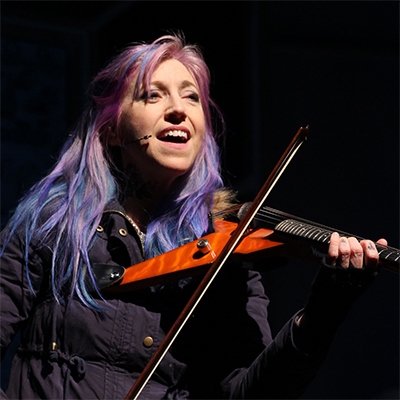 We have also discussed making the lead character of Kat not necessarily be an electric violinist. She would still be a musician but maybe she plays a different instrument. At the moment, there are some very specific gestures and dialogue moments that are about the spark that comes from the electric violin but those could be adapted if need be. But at the moment, we are just making the show as good as it can be with me on the Viper. DR: Tell me about your co-star Wade McCollum. He has been in this musical with you for some time? Do you enjoy working together? Was he been the only person to play Shackleton so far? VV: I love Wade! He is not the first to play that role though. The first actor to play Shackleton was Will Swenson who is a fantastic Broadway star (he did an early reading with us). I had met Wade through our work with Disney. We had written Toy Story The Musical and Wade was our first Woody. When the opportunity came up for Shackleton, we connected again. He is such an inspirational, buoyant person and perfect for this role. DR: The story of the real-life Shackleton was so resilient and inspirational and I feel like in the musical, Kat is inspired by him as much as he is inspired by her music and it ultimately is a love story. How would you describe this to someone who has not yet seen it? VV: It's an adventure love story across a century of time. She finds self-reliance and hope and optimism from him and realizes that she can be "Shackleton" for her son. She doesn't have to settle and she doesn't have to be beholden to someone who doesn't respect her and that she can do this on her own. DR: What kind of audiences have you been seeing? Besides fans of musicals, have you captured the interest of history fans as well? VV: We started the show in Seattle and we found that not only were we getting fans of tech and games, but also Coast Guard members and people on ice-breaking ships! We are even doing an event at The Explorers Club where they have Shackleton's original sextant and some of his family are going to Skype in for it. 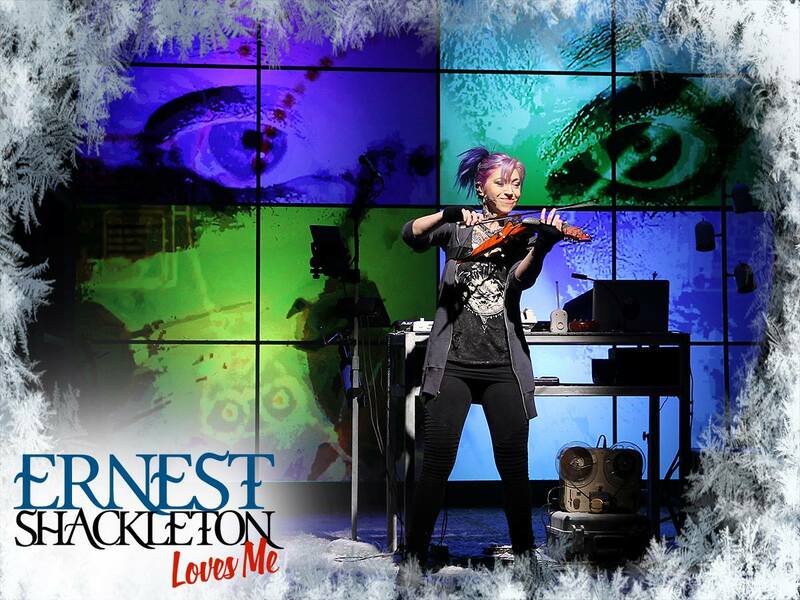 So we have been seeing the Shackleton people, the gaming people, the electric violin fans, fans of musicals. DR: You had quite an active fan base from your GrooveLily days called the Petal Pushers. VV: Yes! And I have seen many of them at these shows as it has developed. It is very heartening to find that what I am doing now is still resonating with them as much as GrooveLily did. Many of them continue to be in my world, not only as fans but also as friends. DR: A couple of years ago you started working with Mark Wood at his Mark Wood Rock Orchestra Camp and in his Electrify Your Strings! program. What led you to reconnecting with Mark? VV: I did stay in touch with Mark over the years but not very actively until two years ago. I had some upheaval going on in my life and I finally was looking up and out again,. It is very easy when you are married to your collaborator to be sort of hermetically sealed while working and not be as connected to the other people in your professional sphere as much. I realized that I was not part of the electric violin community and I reached out to Mark and Laura [Kaye] and asked if I could just come visit their Rock Orchestra Camp and immerse myself in that community. I went there just as a 'camper' and met all of these wonderful musicians there to learn and the talented faculty that they have. Afterwards, Mark brought me on board for his Electrify Your Strings! music programs and as a faculty member for the camp. DR: At his camp, each of the faculty members focuses on different aspects while teaching. What is in your "curriculum"? VV: I love working with students, particularly there where they are so eager. I work with them a lot on presence, improv and full engagement. I play some theater games with them and we break out of that fearful stance - that "violin face". We reconnect with the joy of doing what we do. Simultaneous singing and playing, lyric writing...we get to do a lot over a short period of time! DR: You have so much going in your life right now, is there anything that you still have your sights set on? VV: Even though it has been eight years in the making, Ernest Shackleton Loves Me is such a huge passion project for me and is just hitting New York now. That is my focus for the moment. and who knows what its future may be? Once it is open and off the ground, I am adding on a project in the world of motivational speaking. It will include some of my work with Just Getting Good, some of what I present in Electrify Your Strings. It’s all about peak aliveness. I hope to incorporate stories from Shackleton, stories from my Army training, working with Cyndi Lauper - all things that have brought me to where I am today. DR: Sounds wonderful! Thanks so much for taking the time today.